Today I had to pitch to my Fashion lecturer for a job role concerning a Fashion Auction that our course will be putting on in February. I decided to go for Styling as my first choice and Events as my second choice and choose to go for a management position in both. So fingers crossed, I was so nervous and probably chatted absolute rubbish for the whole pitch, but I felt well prepared, having made two mood boards surrounding the theme last night. I'll post photos of them another time, my tutor still has them. Anyway, the theme we have chosen for the night is 'Freak Like Me,' which is an emerging trend from Asos.com, seen below. I'm so excited about this theme as it allows us to be quite free with what we want to do with the styling of the clothes, make up and hair. When creating my mood board I got ideas from Meadham Kirchhoff's SS12 collection, which can be seen below. When the group met last week to discuss the ideas we had, the theme within Freak Like Me that kept coming up was the idea of 'Fetish' I like this idea but if I was lucky enough to land the stylist management role I would want to make sure we didn't take this too far, instead it would be cool to show it through the make up, smokey eyes and black/purple lips being an idea I put across in this mornings pitch. I think subtly is the key with sort of make up as it could easily be turned into a gothic look if too much is applied, a problem loads of girls in Northampton (where I go to Uni) seem to have, shovel in the dark syndrome! 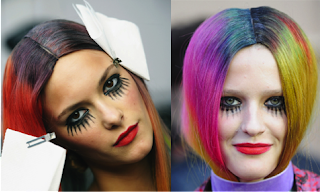 Model Charlotte Free and singer Lady Gaga are key focal muses for me. 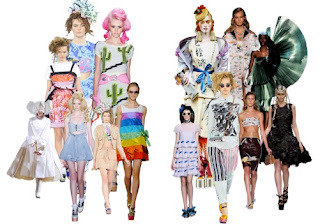 Lady Gaga embodies the 'Freak like me,' vision while Charlotte Free brings a grungey and quirky vibe to the theme, both of which are relevant to it. 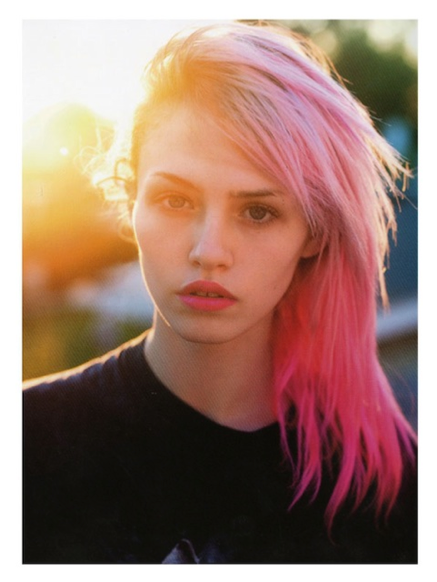 I love Charlotte Free's hair! It deffo had a place on the mood board. My overall vision for the hair is to have the models having bright hair, like Charlotte's, whether that be the same colour or not. Then for the make up to be quite dark and more on the fetish side or with doll faces bringing a circus-esqe look in, as seen again in Meadham Kirchhoff SS12. I think it would look amazing if the setting was dark and the models came out looking like aliens, or quite scary, tying in again with Fetish. I've probably stopped making sense and have started just blurting out ideas all over this post....so sorry! but bare with me I'm nearly done. Just a few more photos to come below. Last term my friend Jess and I took some photos tying in with theme, check them out below. Ill keep you updated with the progress of the Auction preparation! !